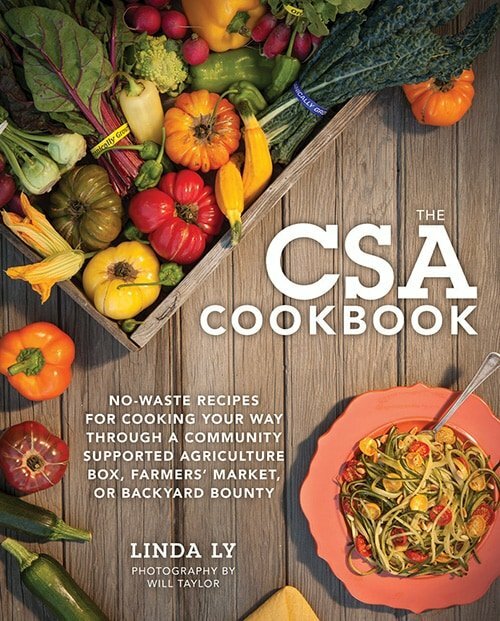 I really like Linda Ly’s The CSA Cookbook. It is not a vegan book, but about 90% of the recipes could be veganized with a vegan substitute. This Kale Stem Pesto is vegan as is! I’m amazed that there are so many recipes that use parts of veggies that I often toss in the compost. This pesto recipe uses kale stems as the main ingredient with some parsley, walnuts, and garlic. In some of her other recipes, she utilizes leaves from bean and tomato plants and dispels the myth that tomato leaves are poisonous. Carrot top greens are used and she stir fries watermelon rind. Again there are recipes that are not vegan, but you can use coconut bacon, tofu, seitan and vegan cheeses to make the recipes your own. My mind is blown by all the cool ideas I’m getting from this book! Tell me what your best tip is to use up as much of any veggie as possible. I need all the help I can get! How many kale recipes have you come across in which the directions tell you to reserve the stems for “another use” or even discard them altogether? Well, friends, this is your other use. Those rigid stems and ribs we often remove are the star of the show here, and they’re every bit as fresh and earthy as their leafy counterparts. 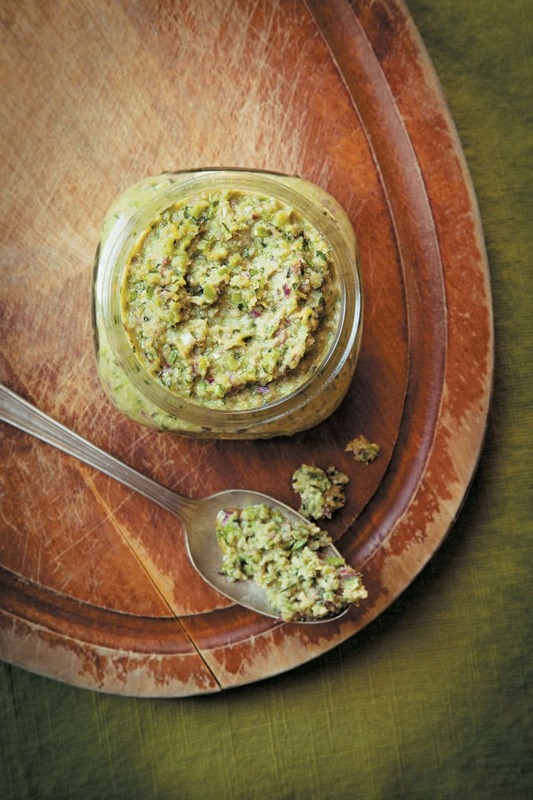 Used raw, they’re a great pairing for the tangy lemon in this pesto. You’re not solely limited to kale stems, either; try this with your other neglected stems, such as collards, cauliflower, or broccoli. Add all the ingredients except the oil to a food processor and pulse until crumbly, scraping down the sides of the bowl with a rubber spatula as needed. Continue pulsing and add the oil in a slow, steady stream until well blended. Some people like their pesto super smooth, but I prefer a bit of texture, so process to your liking. 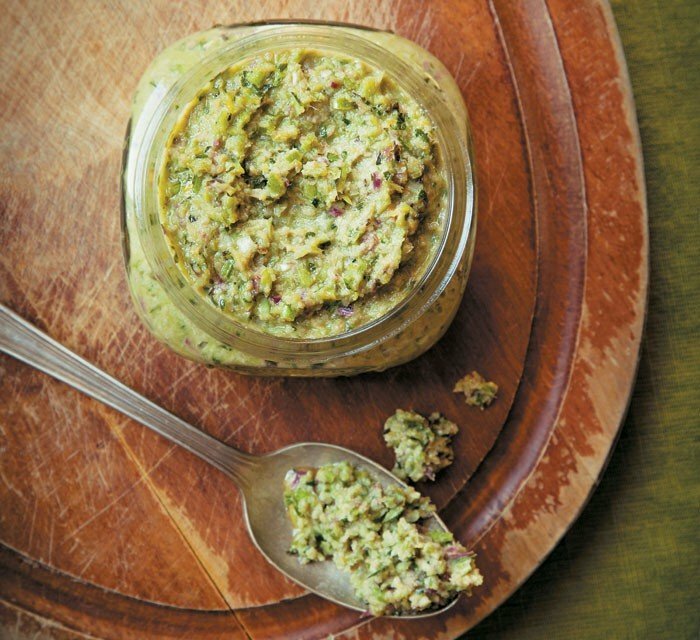 For a thick paste that you can spread onto sandwiches and pizzas, use only ¼ cup of oil. For a thin sauce that you can stir into pastas and soups, use a full ½ cup. I’ve always chopped my stems and added them to my freezer bowl for making veggie soup stock, but this looks like a wonderful way to use them. I’m grateful, too, for a way to use some of the parsley I get in my CSA box. My sweetheart doesn’t care for the stuff, so I almost never use it all. I’m baking homemade crackers today. This pesto would be delicious with them. Thank you! I should have read this blog yesterday before I cleaned my kale and tossed the stems. It really is amazing how much food the average american wastes. Truthfully I think it’s just we don’t know better. I never even thought you could use the stems for anything but the stockpot. I think I’m going to check out this book! Thanks for turning me on to it. I probably wouldn’t have seen it because I usually only buy vegan cookbooks. Hey your recipe sounds so delicious. Will try . Came back to let you know I made it and it is indeed delicious with the crackers. A tiny smear is all we need. So much flavor! Incidentally, I had just one bunch of kale, which made half a cup of stems, so I chopped some of the leaves and added them to the mix. Worked fine. Thanks again for a delicious recipe. Can’t go wrong with pestos and this one looks FAB! what?! mind blown! I have tried to pickle these stems before with no good results. I’m definitely trying this pesto! I love how you can mix almost anything into pesto and it turned to magic. this is such a great way to use up those woody kale stems. I tried this today and it’s delicious! I made a couple substitutions…I substituted the oil w water. (We’re fat free) and next time I’ll use aquafaba to keep the creaminess. I subbed apple cider vinegar for lemon (didn’t have any) and cashews for the walnuts (also out) but left the rest the same. This is delicious! I’m going to have to try using it as a pizza sauce! I think this is a brilliant recipe using the kale stems which otherwise go as a discard! Totally worth trying. Never had pesto before, so can’t compare to the “normal” kind, but this was amazing! Tried the recipe only because I had some kale stems that I didn’t want to just throw away. Mine came out too thick though even with a lot of oil, so I added a bit of water. I find it often depends on the dryness of the veggie. Will this work with frozen kale stems? I haven’t tried it, but I think they would work.